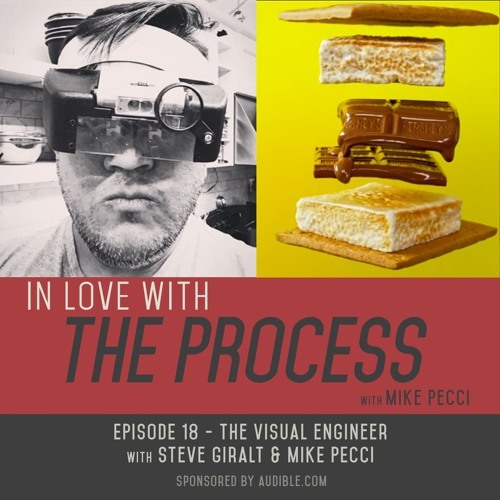 In this episode host, Mike Pecci sits down with Visual Engineer Steve Giralt and talks robots, lighting, photography, and food. Steve is the genius that shot and created that amazing Hersey’s s’mores clip that has gone viral online. At first glance, it looks like 3D animation, but it’s not. It’s all shot in-camera! This is a fantastic episode for photographers. We talk about technique, how to market yourself using Instagram and how he gets work without an agent. Check out stevegiralt.com to see the stuff they talk about. Support our show by going to http://www.audibletrial.com/InLoveWithTheProcess and signing up for the 30-day trial. For each person that signs up, our show gets a few bucks that will help us pay for the show. If you don’t like it after 30 days, it’s super easy to cancel (and we still get paid). We bet you will love it though. Mike is listening to the new Steven King book Dr. Sleep (The Shining 2).